Nanaimo Fishing At Its Best! In another week or so, Chinook Salmon fishing in and around the waters of Nanaimo should be at its best. These fish usually begin to show around the second week of April with the run usually at its strongest during the last two weeks of April and the first week of May. Chinook salmon caught during this time are usually between the 8 lb to 12 lb range. However, it is not unusual to see fish in the high teens, even low twenties caught during this time. Fishing during the latter part of May and into June is still productive and usually offers larger fish. In fact, last year (2018), our Chinook fishery lasted well into the latter part of July. So, if you are looking to have some fishing fun in and around the scenic waters of Nanaimo this spring or summer, look us up. Reel Time Fishing Charters offers convenient moorage, top notch vessel and gear, a variety of different fishing packages and a captain who enjoys his guests as much as he does the water and fish. New for 2019: Fishing Charters combined with Scenic Tours. Beginning this July, Reel Time Fishing Charters is offering summer trips aboard their new vessel, a 26ft Hourston Glascraft. Equipped with a fly-bridge, an enclosed cabin and galley, a stand-up head and more room, this vessel will provide our guest with a fuller and more enjoyable experience on the water. Add this to the knowledge, experience and excellent reputation our business has received in over a decade of fishing in Nanaimo and you have a top rate charter company, skipper and vessel. For our first year, Reel Time Fishing Charters is offering 2 simple packages; a 5 hour and 8 hour fishing trips. See our page on “Nanaimo Fishing Charters and Prices” for more details. Bring your family, your friends or your party ideas and let the good times roll. Great fishing continues in Nanaimo: Report from Reel Time Fishing Charters, September 13, 2018. After two sensational months of fishing in Ucluelet, Reel Time Fishing Charters has returned to Nanaimo to finish our year. Our charters in Nanaimo and Ucluelet produced some of the best fishing I have seen in over a decade. And it hasn’t stopped! Our first three trips back in Nanaimo this past week produced some nice hook-ups out in front of Neck Point, Pipers Lagoon, and Entrance Island. It wasn’t until today however (Thursday, September 13) that we finally got dialed in as to where the fish where really holding and feeding, a place many local anglers call “The Brickyard”. Fishing down at about 140ft with a “Kitchen Sink” skinny G on one side and a “Gold Nugget” coho killer on the other, we managed hook into 10 Chinook during two 4 hour charters. Many of these fish where 3rd year feeders meaning they where anywhere between 7 to 10lbs. The surprise however was that there where still a few 4th year spawners in the mix, 1 that took us for a good ride until he finally came undone. With the amount of bait we were marking in the area, I highly suspect these fish will move on any time soon. If you are looking to take advantage of some wonderful sunrises, amazing sights and some pretty scrappy fish before we pull the boat out at the end of the month, please check our schedule for remaining openings. Otherwise, to all of you who have followed or fished with us, thanks…, hopefully we’ll see or hear from you in 2019. Fantastic fishing continues in Ucluelet, Vancouver Island, BC. These three halibut along with 6 chinook salmon were taken off the Big Bank in less than 5 hours. To book a sensational day of fishing while the weather and fishing remains good, call us. We still have a few openings for the latter part of August and beginning of September. Vancouver Island Fishing: 2018 Fishing Report from Reel Time Fishing Charters, Nanaimo B.C. Fishing in Nanaimo continues to surprise even the old boys. As an older run leaves the area, a new run of salmon seem to appear, often better than the previous. Our past charters have been hooking fish in the mid to high teens. Whether we’ve been fishing further ashore (Winchelsea Island/Dorcas Rock) or closer to home (Five Fingers/Clark Rock), the story has been the same, lots of bait and great salmon fishing. And, with June just around the corner, anglers will be able to retain Coho that have shown up over the past few weeks as well. If you are visiting Nanaimo soon or if you are simply wanting to get out and catch few of these great fighting good eating fish, feel free to contact us. Chances are, you won’t be disappointed. Sensational Chinook Fishing Continues In Nanaimo, Vancouver Island, B.C. 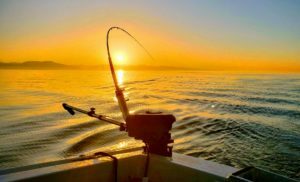 Vancouver Island Fishing Adventures with Reel Time Fishing Charters: A few days ago, I heard a report of someone turning up their nose at any decent fishing in Nanaimo. Truth be known, Nanaimo offers some great fishing, particularly during the months of April and May. In fact, over the past few weeks, we have limited out on almost every single Nanaimo fishing charter. Most of the Chinook salmon we’ve been catching have been in the 8 to 12 lb range with a few in the mid teens and one that topped the scale at just over 20 pounds. The other great feature about this years run is that the majority of the fish we’ve been catching are marbled, a delicacy to many of our anglers. And they have been scrappy which always make reeling one in a lot of fun. If you are looking to catch some of the best fighting and eating fish of the Pacific North West, look us up. A four hour trip (which is usually all that is required right now) is only $380.00 CAD. Make some memories and enjoy this incredible resource and all its beauty while it lasts. Over the past few weeks, we have had the opportunity to log in a number of trips in and around the Nanaimo area. The first few trips produced a few fish in the 26 to 27 inch range. These fish were caught in the 130-140 foot range out in front of Clark Rock/Pipers Lagoon as well as just north of Neck Point in a place known as the Brick Yard. Subsequent trips produced nothing we could put in the box so for our final trip of the week, we did a little searching. Word was out that a number of fish had been caught off Coffin Point in Ladysmith so we started there Wednesday morning. We marked some nice bait balls but didn’t touch any fish. We then tried Pollier Pass and managed a few smaller fish. The guest appearance there as a pod of Orcas that put on a nice display for our guest. From Pollier, we traveled North to Thrasher Rock where we had action almost immediately. Finally, a few larger fish. Last on our list of adventures that day was Entrance Island. Not much bait there and no bites. September of 2017 has produced some of the best Fall fishing I have ever seen in the Nanaimo area. Last week, we were hooking many large returning Chinook by Entrance Island. When those fish moved, we tried the shallows by Neck Point. We weren’t disappointed! Our boat along with other local anglers were consistently hooking fish there between the 8 to 15lb range, the smaller being feeders, the larger being 4 year returning fish. Small 3 inch spoons between 120 to 150 on the rigger seemed to be working for the most part. Our last trip on Monday (September 18) produced 1 nice pink a little higher up in the bait column as well as some nice Chinook deeper down. Earlier trips were also producing Coho out by the Five Fingers. Reel Time Fishing Charters will be in the water for another week. After that, we will be pulling the boat for the remainder of the season. This has been a fantastic year and we wish to thank all of you who have fished with us and read our reports. Our fishing will begin again next February (2018). If you wish to book a trip with us, keep in mind that the last 2 weeks of April and the first 2 weeks of May produce some of the best fishing through the Straight of Georgia (Nanaimo). For the months of July through the first week of September, Reel Time Fishing Charters moves the boat and business to Ucluelet, the west coast of Vancouver Island where salmon and halibut fishing can be spectacular. Check our website under “Nanaimo Fishing Charters and Prices” and “Ucluelet Fishing Charters and Prices” for details about our adventures. Ucluelet fishing with Reel Time Fishing Charters, Vancouver Island, B.C., Canada: The big story behind this summers fishing charters was the number of large halibut that were caught 5 to 20 miles off shore. During the months of July and August, we landed numerous fish in the 40’s, 50’s, 60’s, one that even tipped the scale at close to 80 lbs. And it wasn’t just us 🙂 Many other guides boats either from Ucluelet and Tofino were the reporting an abundance of large fish, many of them being caught on the Big Bank (shallows), Long Beach Bank, Inside Lighthouse Bank, and the Fried Egg (just southwest of the Outside Lighthouse Bank). Salmon fishing was a different story. Areas that produced fish last year were empty this year. And when a bank or area turned on, the fish did not stay for long, something that probably pointed to the small size of the run. The only place that produced fish on a regular basis was the Rats Nose on the Big Bank. Another concerning factor of our Chinook fishery this year was the amount of small fish. Many trips produced 3rd year fish that were well below the mid-teen range. In fact, I dare to say that most fish caught on the Big Bank this year were of the 7 to 9 pound range with a few exceptional days where a school of larger fish would move in for a day or two. Having fished Ucluelet for many years, I truly believe that our salmon fishery, particularly our Chinook fishery is in trouble. And so, to all of you reading this post, I encourage funding or getting involved in a local salmon enhancement program. The Pacific Salmon Foundation is a good place to start (http://www.psf.ca). Letters to local MP’s concerning the plight of our salmon fishery would be helpful as well. My hope is that we will safe-guard this resource in a healthy and sustainable way so that generations to come may enjoy this wonderful and amazing fish.